EMM removes the complexity from managing a multi-OS, multivendor, and multi-purpose mobile business environment. EMM manages mobile devices, applications, content, and security from within a single management console. For many organizations, adherence to regulatory compliance standards is a necessity for their business. This requires that security not be circumvented on an unauthorized mobile device and that reporting capabilities allow for network integrity to be confirmed. One of the benefits of mobile device management services is that compliance initiatives can be monitored and tracked through a centralized console. While traditional technology support may shy away from any device that isn’t owned by the company touching the network, BYOD has huge cost savings and productivity benefits. In the past several years, many organizations have begun to loosen their grip on policies around employees using mobile devices to access certain data, such as email and calendars. However, attention does still need to be paid to ensuring that company security is not compromised for the sake of efficiency. Properly managing these devices means that no security will be compromised when these personal devices are being used. Being able to manage users and their devices remotely are huge benefits of mobile device management. By remotely monitoring and managing your mobile devices, you can guarantee the security and health of all mobile devices connected to your network 24/7. Additionally, having remote control over mobile devices provides the ability to remotely disconnect or disable any unauthorized users or applications. As with most technology management, making sure that all systems are up-to-date and patched is a vital component of security. One of the benefits of mobile device management, especially when outsourced to a managed security services provider, is that these updates can be centrally controlled and audited. This not only protects your devices and data, but is also a requirement for government compliance regulations, such as HIPAA, SOX, and PCI. Any applications that are necessary in order for your workforce to remain productive on their mobile devices also needs to be controlled and regulated. Mobile device management provides centralized control to allow for users to install these applications on their devices. The centralization of mobile device management provides for several additional benefits such as role-based access management and the ability to remove or disable an application if a business process changes. Another one of the benefits of mobile device management is that the same security procedures and protocols that are in place for your organization will be able to extend to protect the mobile devices on your network in addition to the static ones. This means things such as identity management, password regulations, access limitations, and blacklists will all carry across to mobile devices, so no loop in security protocols will be created. 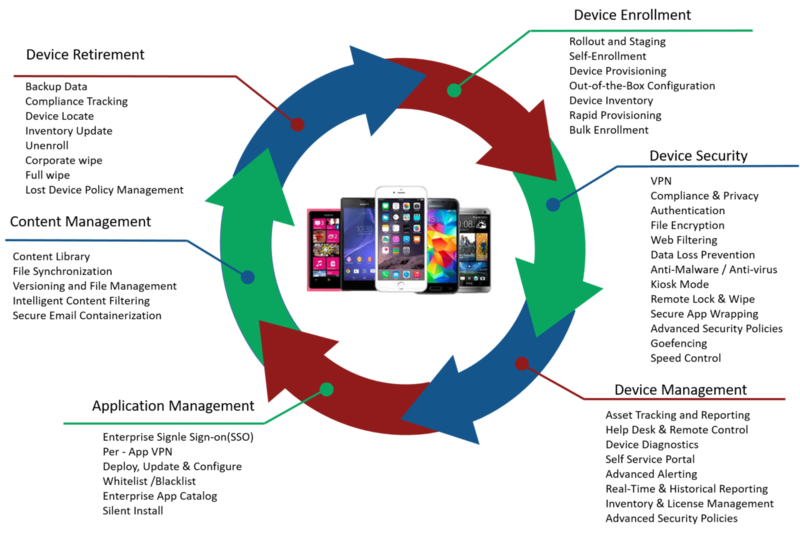 Mobile device management solutions are usually equipped to be able to support new device registration automatically. For many, the user or owner of a specific device can be sent and email that will allow them to register the device and then gain access to their various programs and applications that they need. This removes the need to pass around a protected key that would cause serious disruption if it was misplaced or even fell into the wrong hands. It also removes the IT department from the responsibility of having to manually set up every device when one of the employees gets a new phone or tablet and wants to check their email. When a device is connected to a mobile device management solution, data that is connected to one of the corporate applications will automatically be backed up in accordance with the company’s traditional backup policies. This supports business continuity measures through alleviating mobile devices from being a single point of failure for information loss. All in all the benefits of mobile device management allow you to be able to accept mobile devices, and the increased worker productivity they provide, into your organization without worrying about whether or not you are compromising your data or security. Are you interested in learning more about mobile device management? Contact Danush today to learn what we can do for you!